When I bought my Superia track frame kit, I all of a sudden became the owner of a super rare Shimano Dura Ace 10 mm pitch components group. Yes, I know that the chain set was assembled and that there was even a Dura Ace headset installed. But when I was asked if I was also interested in having the rear sprocket, I got the whole wheel set. So, besides the frame and fork, I had the chain set, bottom bracket set, headset, sprocket and front and rear hub! My original intention was to sell the chain set, but when I realized, that I had nearly the full group set, I decided to keep it, because I would never get this opportunity again. All that was missing, was a matching 10 mm pitch chain. It seems that the chain is the most sought-after part, but since I got the rest of the parts so easily, it was worth trying to make the set complete. I do not worry that much about the missing chain pinch or chain whip. Working on a 10 mm pitch chain must also be possible with standard (modified?) chain tools or home-made tools. What is so special about 10 mm pitch parts? Well, all bike (drive) parts in the world are designed around a 1/2 inch (12.7 mm) pitch chain. That is the centre to centre distance of the chain pins. A very long time ago, chain pitch was 1", but that was a different chain design. Somewhere in the 1970s, Shimano people got the great idea to reduce the chain pitch to 10 mm. The chain rings and the sprockets became smaller and the chain shorter, resulting in less weight. As always, you may ask what Shimano's real idea was: to design and make better components or to make something different, unique and incompatible? Dura Ace 10 mm pitch series were introduced in 1976. Somehow, the 10 mm pitch series never convinced the cycling world and the parts weren't a big success, despite the world championship match sprint (1976) of John Nicholson from Australia with these components. There is a story, that the Keirin federation banned these parts, because the riders would have an unfair advantage. But that could also be just a nice bla bla story. Somewhere in the 1980, the 10 mm pitch series were discontinued. Not only the chain is unique. 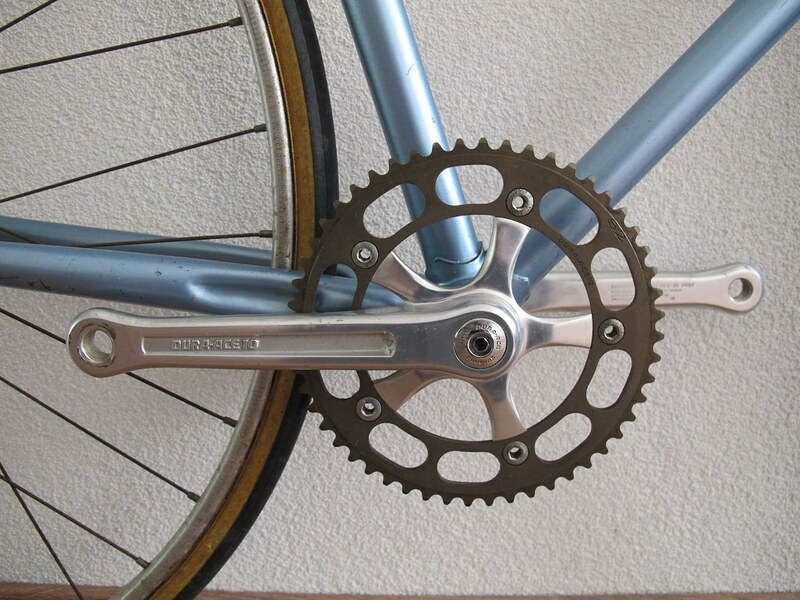 Of course, chain rings and sprockets have to match the smaller pitch and are different, too. And because the chain rings and sprockets have a smaller pitch, but the same number of teeth as regular components, the diameter is smaller. 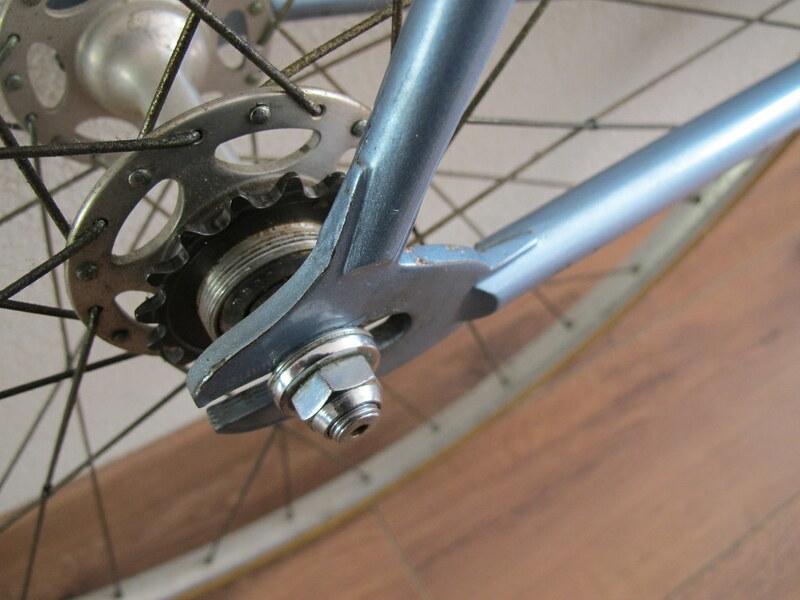 That makes it necessary to make the bolt circle diameter of the cranks smaller, as well as the diameter of the threads on the rear hub. Head set and bottom bracket set are the same as the normal 1/2" pitch Dura Ace track series.